List of locations that support real-time transit tracking added to post. The Commute tab in action. The Commute tab shows your usual route, along with time estimates based on current traffic conditions. If there is a delay, the tab shows alternate routes, and on Android you'll get notifications about traffic disruptions as they occur. Google is also adding more information about delays for those with mixed-mode commutes (e.g. users who drive to a train station, then walk from the station to work). Maps now factors in traffic, train departures, and foot traffic into an overall commute ETA. An example of a multi-mode commute. Perhaps more exciting for the commuter who can't do without their morning tunes, though, is the integration of Spotify, Apple Music, and Google Play Music (shown in header image). Placing controls in-app reduces frustrating one-handed toggling. 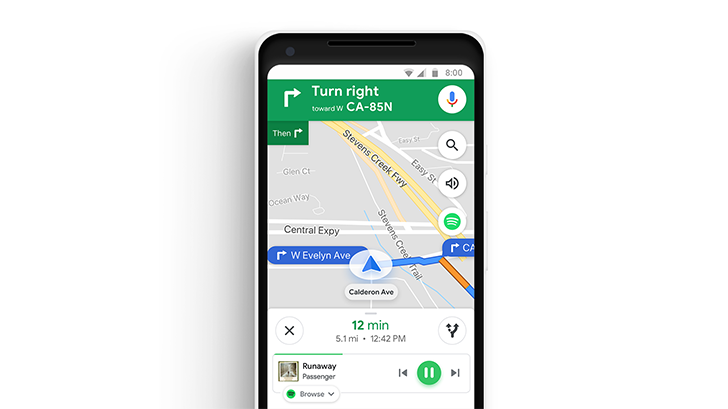 While the Apple Music and Google Play Music controls are limited to basic functions, Maps allows users with Spotify for Android to additionally browse songs, albums, podcasts, and playlists. The new features are rolling out over the course of this week, and seem to be coming in pieces via server-side update (though Google suggests updating your app anyway). I'm currently not seeing anything yet, but let us know what you spot.